Why did this journey choose me? Should I try to ignore its calls, or accept that it’s part of me? Learn about Eoin’s Irish language journey and maybe share your own by using the comments section below. Meanwhile, I seemed to be interested in what I could do with computers early on. Started getting emails from people interested in their Irish heritage, the Irish language. People wanted to connect, and finally they had this new chance with the web. I was selling software for Celtic languages. Seller in Germany. First idea: emails for a month. But I soon realised that people would want to hear audio. Built the product. Launched with about 30 lessons written by Sasa. Advertised it on IrishGaelicTranslator.com, which I then sold for its advertising revenues. Slowly became a team, with 2018 being a turning point in a “team” being established. We weren’t speaking regularly before then. We have big plans for new ways for our members to learn to speak the Irish language, and to CONNECT with each-other to coordinate and support. I’m still surprised and humbled by the number of people outside of Ireland learning the language. 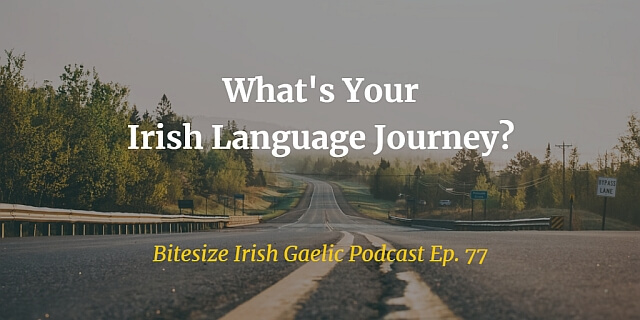 What’s YOUR Irish language journey? Please share with us, share your story below. Eoin– Thanks for sharing your journey. My journey is very different because I was not born in Eire, but in the US. The second language taught to me by second generation Irish- Anerican was French. French and Latiin in secondary school. Followed by Bachelors Degree in Russian accompanied by French and German courses and accompanied by the completion of US Star Department course in Serbo-Croatian. Picked Spanish and Arabic as an adult. Finally as a result of hearing an unknown language on a local radio program, I discovered Irish. The fact that I could not identify my ancestral language was devastating to me. I cried. I started 18 months ago to study Irish with local lessons. My proficiency increases everyday and I welcome Bite Size Irish emails. Thank you for your excellent work on behalf of the Irish language. Hi Maureen, thanks for being so open about your journey. That’s crazy how it was just a random song (I take it?) on the radio that go you interested in the Irish language. Funny story. I sound far away in this episode, because I was speaking into the back of the microphone by mistake! 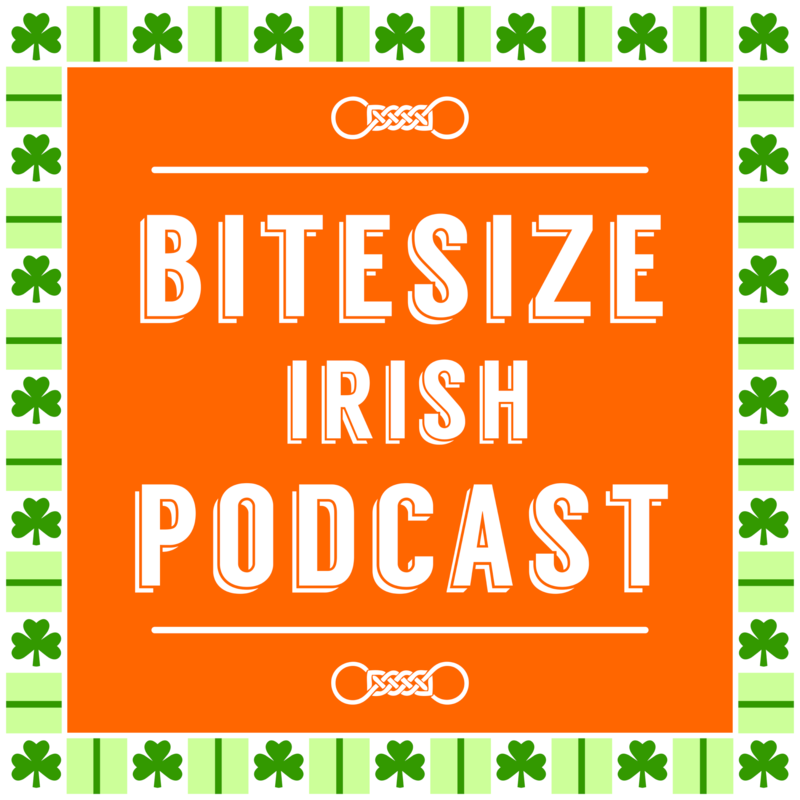 Rath na raithní oraibh a Bitesize! Great Episode. How did your tuismitheoirí feel about the language any stories going back in time? Also would be great to see a biography page for the people who work at Bitesize. Eoin – I listen to your podcasts at work. Makes my time SO MUCH BETTER!!! I’ve been having trouble with my mind. Thinking is becoming harder, short term memories are fading too quickly, and I am way too young to succumb to this. So, as your podcast on “rewiring the brain” touched on, I am working to save mine by creating new neural pathways with languages and other mental excersizes. I originally started with German. As it was the language I spent the first three years of my life with it seemed natural. As things happened I came across the group Gaelic Storm and fell in love with their music. Some of which is in Gaelic and thus I was won over! So now I get to drive my husband crazy with the new words and phrases I’m learning. 🙂 I figure it’s better than driving him crazy by forgetting everything! Definately more fun.